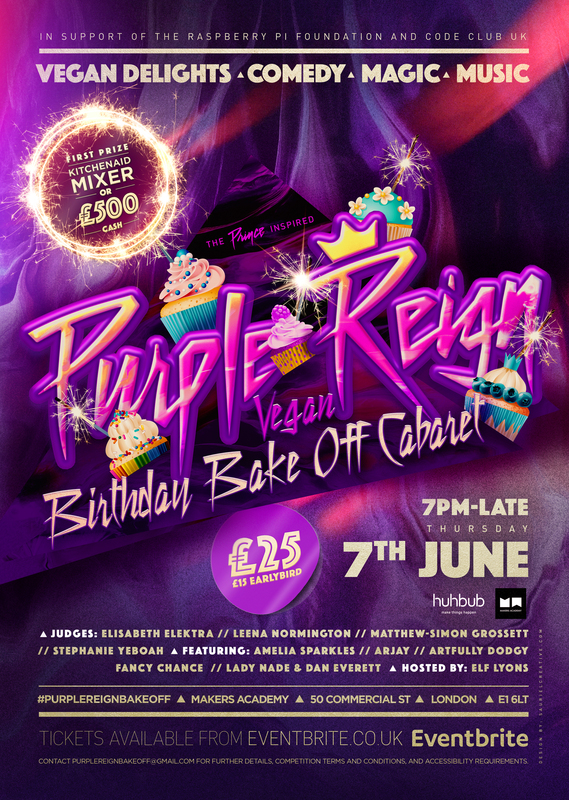 In honour of what would have been Prince’s 60th birthday on Thursday 7th June, we are inviting you to put your best Prince-inspired vegan bakes forward and help Code Club serve 100,000 kids in the UK. Email purplereignbakeoff@gmail.com with your idea. Sweet or savoury. Photos and sketches encouraged but not necessary. The 10 best ideas will compete at an intimate night interspersed with comedy, magic and music in tribute to Prince, and vegan afternoon-tea style canapes. If you’d like to attend the event, tickets available here. Deadline for entries: Thursday 24th May, 11pm GMT. Free entry. Finalists will be contacted by Thursday 31st May and must be able to attend the event on Thursday 7th June. The competition is open to residents of the United Kingdom aged 16 years or over except employees of Huhbub Ltd and their close relatives and anyone otherwise connected with the organisation or judging of the competition. Route to entry for the competition and details of how to enter are via email, www.huhbub.com, Twitter, Facebook and Instagram. Closing date for entry will be Thursday 24th May 2018. After this date the no further entries to the competition will be permitted. The rules of the competition and how to enter are as follows: Email purplereignbakeoff@gmail.com with your idea. Sweet or savoury. Photos and sketches encouraged. The 10 best ideas will compete at an intimate night interspersed with comedy, magic and music in tribute to Prince, and vegan afternoon-tea style canapes. The prize is as follows: Kitchen Aid mixer (up to the value of £599) or £500 cash. The prize is as stated and no other alternatives will be offered.The prizes are not transferable. Prizes are subject to availability and we reserve the right to substitute any prize with another of equivalent value without giving notice. The winner will be notified on Thursday 7th June 2018. This promotion is in no way sponsored, endorsed or administered by, or associated with, Facebook, Twitter or any other Social Network. You are providing your information to Huhbub Ltd and not to any other party.